Lumbar, hyper lordosis, and/or scoliosis. Pectum Excavatum and/or prominent 12th rib. Plus the characteristics of JHS. 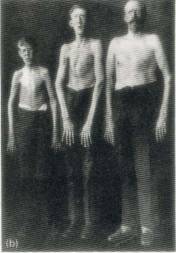 Patients with any of these two conditions can have marfanoid habitus, Marfan Syndrome being the most severe. Patients with Joint Hypermobility Syndrome (JHS) also have the special characteristics already described.